Summer is synonymous with firing up the BBQ and enjoying cookouts with those that matter most. I’ve been anxiously waiting to turn on our grill and make some juicy and delicious burgers. 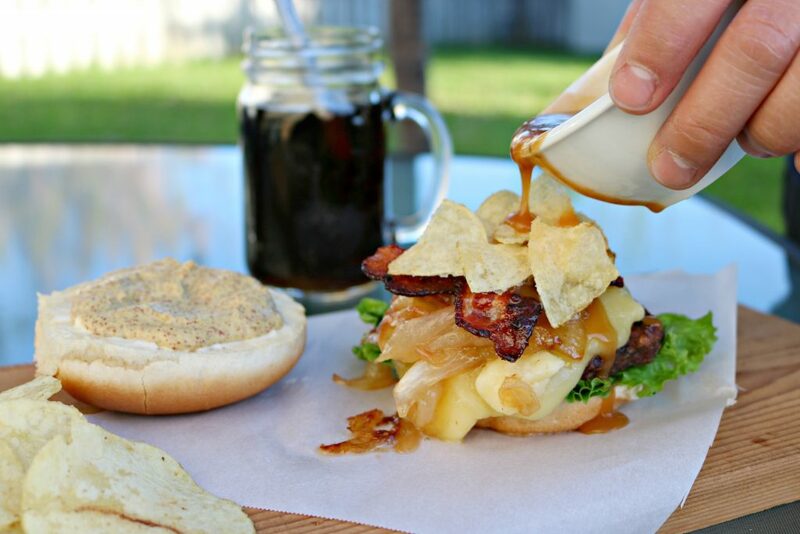 We have always been big fans of burgers and using gourmet toppings to put them over the top. Not to say that there is anything wrong with the regular stuff, but trying new flavours makes meal-time less boring! Plus, this summer Canadians will be celebrating our great country’s 150th birthday. 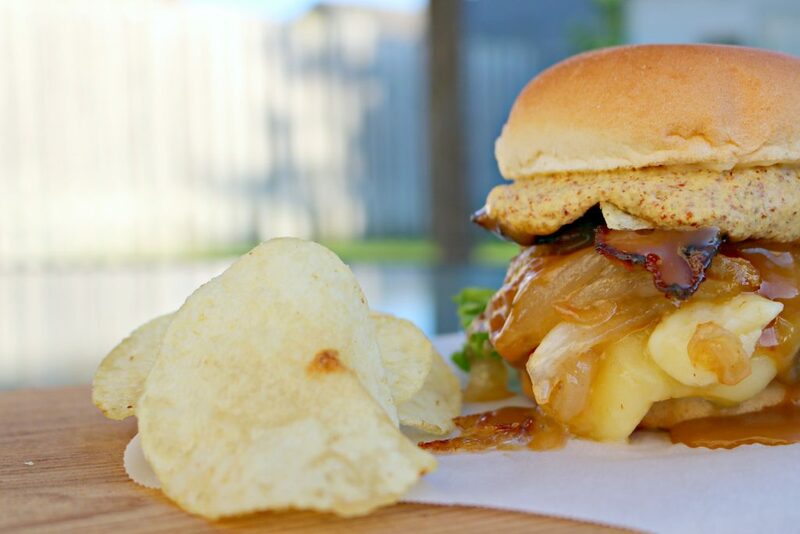 To get the party started, we have gone across the country to find unique burger topping recipes that represent four of Canada’s most distinct regions. Not only do these recipes spice up a classic burger, they let you experiment for less, with a box of 20 Great Value Beef Burgers for $15. While making the Ontario burger was tempting since it’s my province, the Quebec burger just called my name. Because, poutine. Quebec is known for having amazing poutine. While we have some pretty great poutine in Ontario, there’s just something about the poutine in Quebec. That’s why we headed to Walmart to pick up some Great Value ingredients to help us recreate the poutine-inspired taste we craved. The first step was to cook the Great Value Thick-Cut Smoked Bacon, sprinkle it with pepper, smother it with Great Value Table Syrup and bake it in the oven until it’s perfectly crispy. While that’s in the oven, the onions are next. 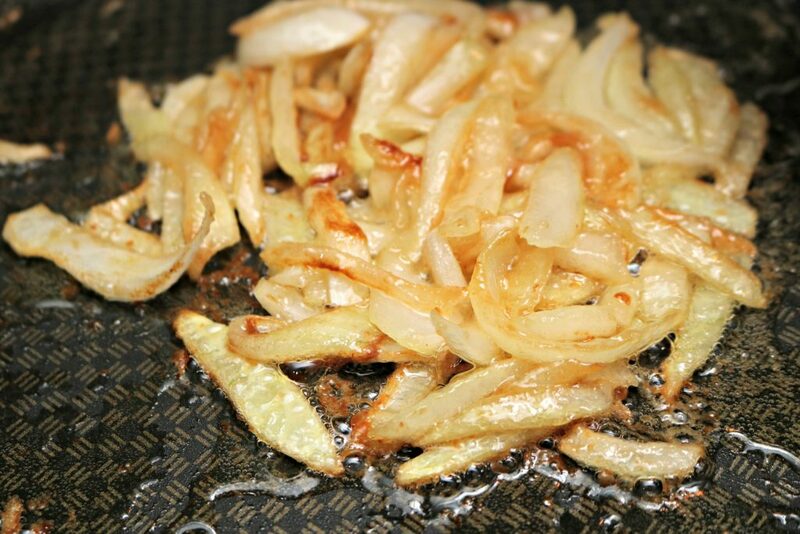 Making the most perfect caramelized onions is actually easier than you may think. All you do is chop the yellow onions, melt some Great Value butter, add granulated sugar and Great Value salt, then sauté until they are golden. While I did all of this, Darasak fired up the grill and cooked up our burgers to order. I prefer my burger well done and that’s the beauty of making it at home. You can cook it to any temperature you’d like. Top it with Great Value poutine sauce, cheese curds, crumbled Great Value potato chips, curly lettuce, creamy mayo and grainy deli mustard. You’ll love it! Quebec is known for its signature Poutine dish. 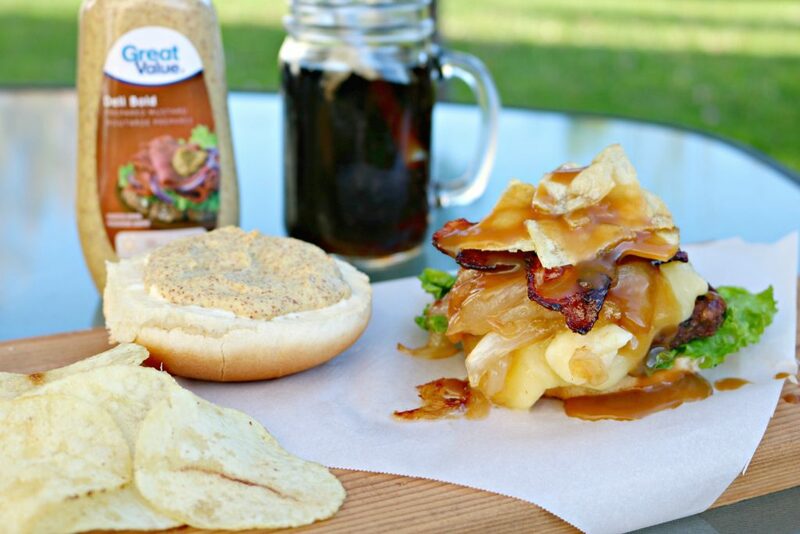 The Quebec Maple Bacon Poutine Burger combines these unique flavours with maple bacon and potato chips instead of traditional French fries for added crunch. Topped with Great Value Poutine sauce – this juicy burger leaves nothing to be desired. For the bacon: line a baking tray with aluminum foil and top with a baking rack, (or cooling rack). Lay the bacon strips in a single layer and season with pepper. 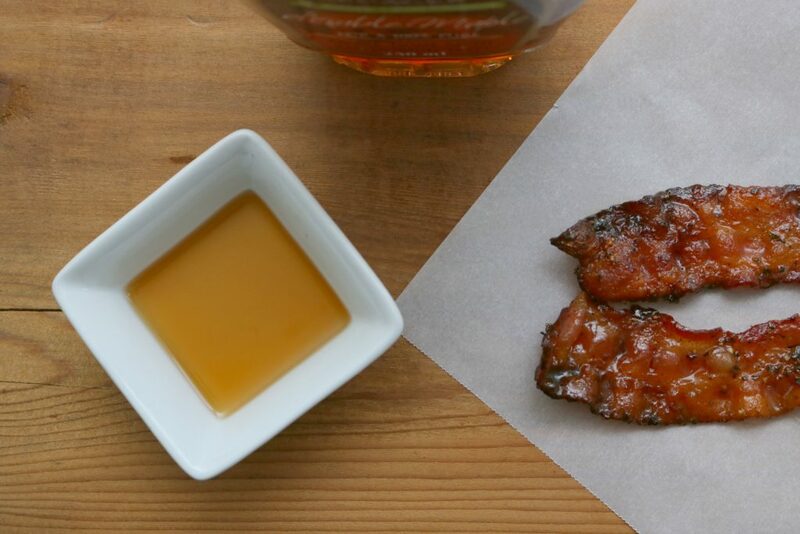 Baste the bacon with maple syrup and bake for 25-30 minutes, until crispy, turning halfway through to baste other side. Remove the rack and allow the bacon to cool. While the bacon is cooking, prepare onions. Heat butter in medium skillet over medium low heat. 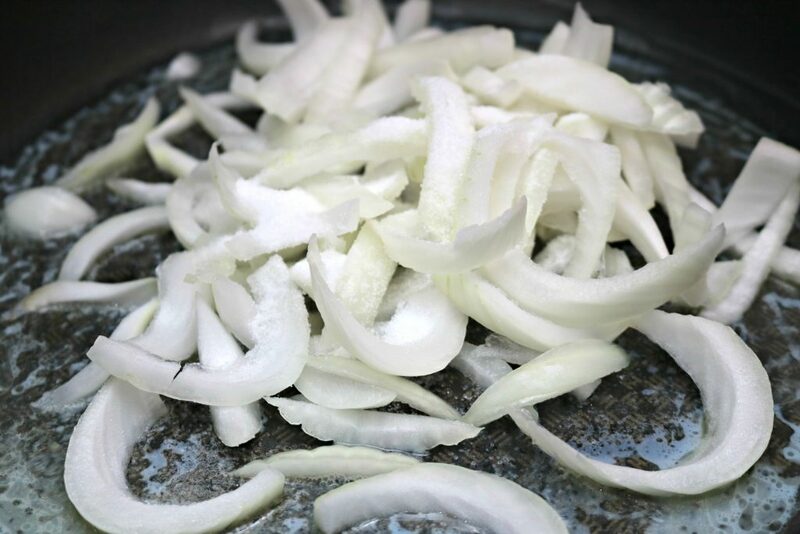 Add onions, salt and sugar and cook for 20-25 minutes until onions are golden brown and soft. Just before serving, bring the contents of the poutine sauce to a low boil and keep hot, stirring frequently. Meanwhile, heat grill to medium-high. Grill burgers according to package directions. During the last minute, top with the sliced cheese curds. (Slicing them in advance will assure that they melt perfectly and don’t stay cold in the middle). Spread the bottom of each bun with mayonnaise, then lettuce, top with the cheeseburger, and onions. 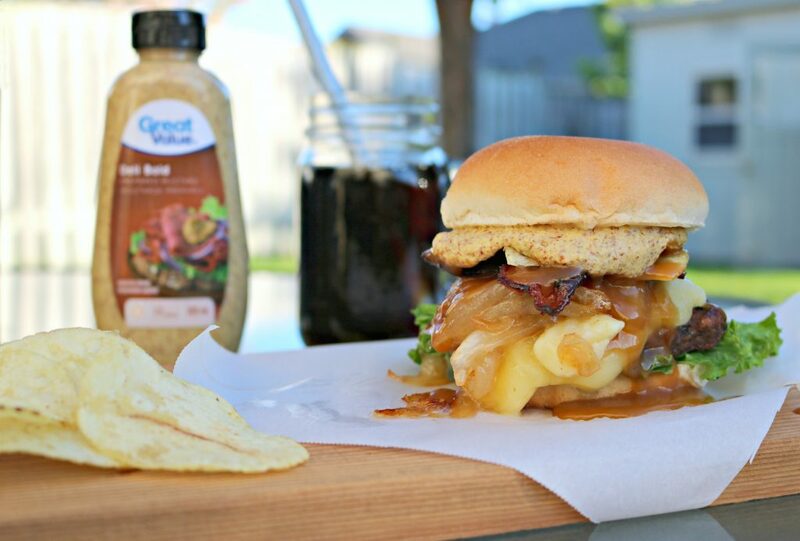 Spoon over some hot poutine sauce, a few potato chips and top with a grainy mustard spread bun. Enjoy! 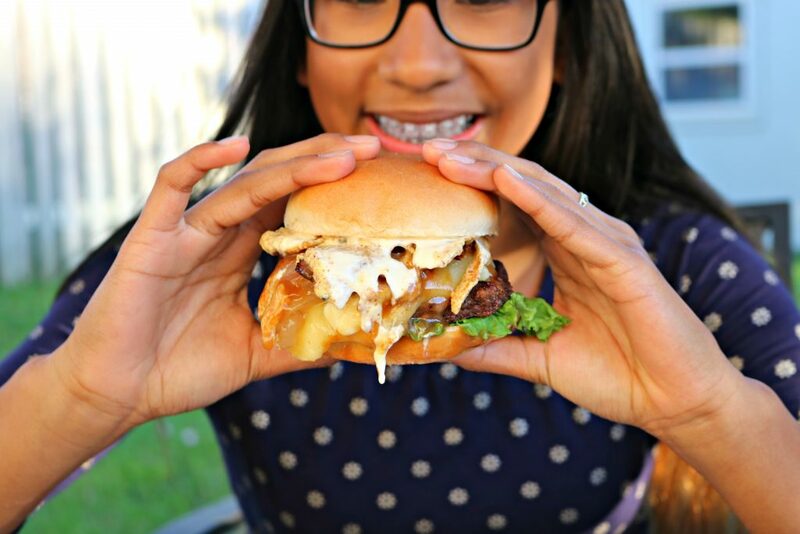 Is there anything better than a burger with toppings that just overflow? The sauces and condiments are so delectable. 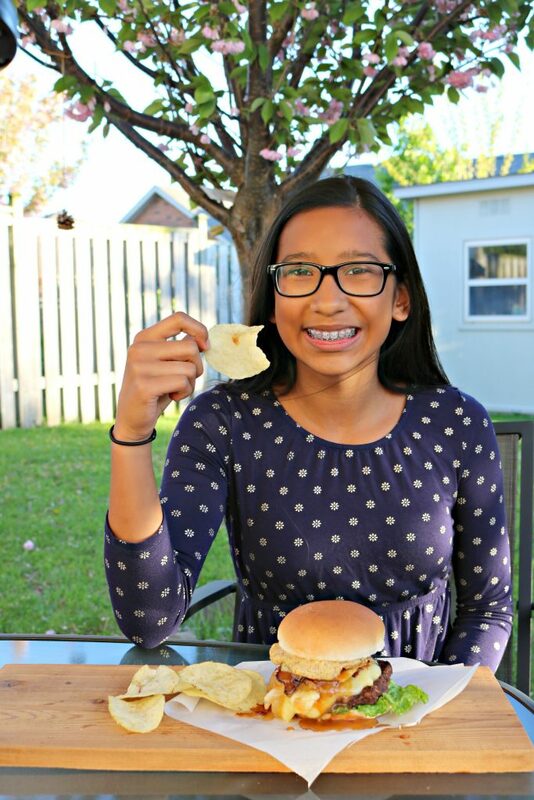 The burger can be topped with potato chips, or you can serve it with chips on the side. Gabby loved the melted cheese curds and the poutine sauce, but the grainy mustard, creamy mayo and crispy bacon just put it over the top! As you can see, it was a hit in our house. 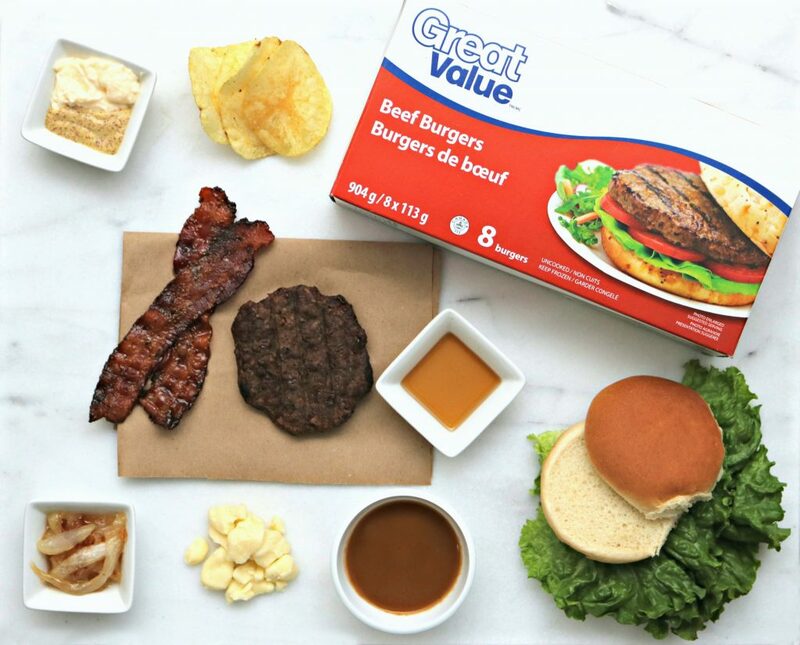 We can’t wait to try the rest of the regional Great Value beef burgers. Read on for the rest of the burgers, you can thank me later. Sauerkraut is a nostalgic and familiar ingredient in the Maritimes, and is made on Tancook Island, NS. It is eaten primarily with sausages, but also great on burgers. When paired with peanut butter, these tangy, sweet, nutty flavours work surprisingly well together. Get the full instructions, here. Luscious, ruby-red cranberries grown in BC are in season in the fall. Fortunately, dried, frozen, and canned versions make it possible to enjoy their tart goodness year-round. Fruit and vegetable influences are strong on BC menus. Here, love of cranberries and vegetarian influences, merge in a cranberry hummus. Make the recipe, here. Alberta produces some of the world’s best beef and pork. Mustard seeds grown in many a farmer’s field is a natural condiment. In Saskatchewan, ingredients like wheat and lentils stock markets all around the world. Made with canola oil and bacon drizzled with honey – The Ultimate Prairie Burger delivers the best flavours from the west. Try the recipe, here. With Canada’s 150th birthday this year, there is no better time to celebrate. With these regional-inspired burgers, you’re sure to please your whole family and hear only hear compliments at your next cookout. Make sure to head to your local Walmart to pick up all of the delicious Great Value ingredients to make these burgers. Which burger are you most interested in trying? Note: This post is sponsored by Walmart Canada as part of the Walmart Great Value Burger program. In exchange for this post, I have received perks in the form of products and/or compensation. All opinions on this blog are my own. Your burger looks amazing! I don’t think I’ve ever seen one quite like this. I’ll have to add it to my weekend cookout. The family will love it. I’ve never heard of poutine but it looks and sounds delicious. I love a good burger, you can’t go wrong with a burger. You so gotta try it girl! You’ll love it! I can’t wait to try poutine in the land that it was created! Until then, I’ll have to check out this recipe for it, and it looks SO GOOD by the way! I love an overflowing burger! damn that looks tasty. Carmelized onions makes everything better in my book! I’m so with you Ryan! Caramelized onions are the bomb! I always love finding fellow Canadian bloggers! This looks like the perfect meal for a Canada Day celebration! Hi five my fellow Canadian blogger! Hope you enjoy the recipe! Okay, that looks amazing!!! I love the addition of the potato chips, too! YUMMY! Yum! This looks so delicious! I need to try out these burgers! You so gotta try it! You’ll love it! I love Canada but not sure if I want to eat this, it might give my heart a pounding 😀 😀 😀 But sometimes I do love a bit of junk food. This looks so good! I love maple bacon! I may crave this all weekend now! So good! I love maple bacon too! You gotta try it when you can! You’ll love it Brandy! We’re definitely making it this weekend! Oh wow this looks amazing! I LOVE onions so I have to try it out. This burger looks amazing. I love to treat myself to poutine when I can. Mixing it with a burger is pure genius. Best of both worlds! Hehe! You gotta try it! You had me at poutine! This sounds like a really tasty burger, I love anything with bacon on it. The burger looks delicious. My kids like to stack as much as they can onto theirs until it just falls apart. My kids are the same! The taller the better they say! Now I am in the mood for a burger and cheese curds! I so wish we had a place that sold cheese curds in our area, sadly we don’t. No! Have you tried looking at Wal-Mart? This burger looks absolutely crazy. But an inspired crazy. I love it. I have never tried potato chips with burgers. I will have to try that out sometime. You’ll love it David! My hubby loves the crunch it has! Wow that burger looks amazing! 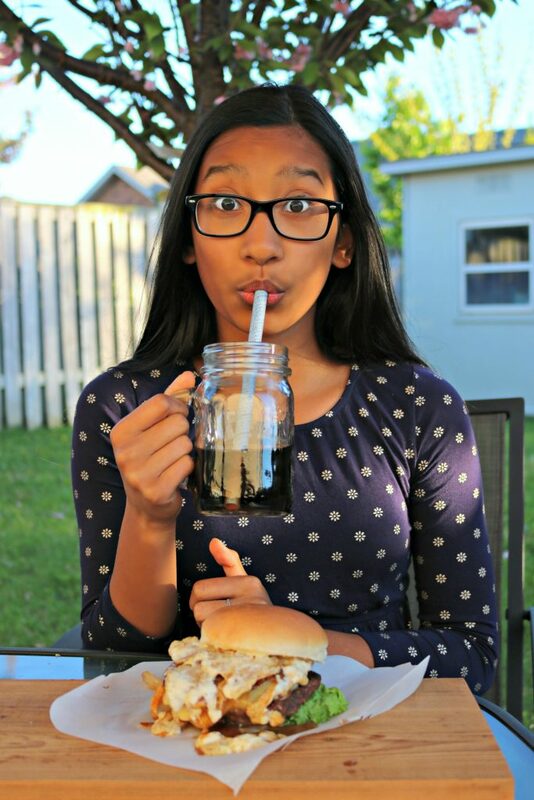 We love grilling burgers here during the summer! Although we usually make them by hand! I will definitely have to try this recipe out. We love grilling too! You won’t be disappointed! It looks really delicious, though I love burgers but I am trying to avoid these to attain a good health but I am surely going to try it on the cheat day. You won’t be disappointed! Enjoy! My sister in law loves poutine! Can’t wait to try this recipe, looks so yummy! She’s going to love this burger! Enjoy! I have never had a burger like that before but it looks really good. I do like mustard so I think I’ll give it a shot. That looks good to me. I know some people might look at it and think it looks weird, but I really like the looks of it. I would like to try it. You so gotta try it Dawn! Sometimes the weirdest is the best! This burger looks so good. 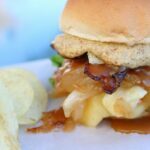 I love the bacon on my burgers but only do it once and a while so I will have to do this recipe. We love grilling out in the summer. Thanks for shairng the recipe. My pleasure! Glad you like the recipe! We love grilling in the summer too! What an absolutely delicious sounding way to celebrate Canadiana, this burger sounds absolutely amazingly delicious, I bet my other half would love to try this as well. Oh I’m sure your other half would love it! My hubby loves it! The Ultimate BC Burger with cranberries sounds delicious! Although I’m drooling over the burger you made because poutine! It’s a must try burger! I’m thinking of making again this weekend! Oh goodness, gracious, you’ve got me drooling. I put chips on all of my sammy’s so I am glad to see someone else that does this. I can’t wait to try your recipe. This burger got me drooling too! You gotta try it! We LOVE Great Value products from Walmart. It’s always delicious and never disappoints. That Burger looks delicious. I know right! They have awesome products! You gotta try this burger! It is super delicious! Yum! Having grown up in Montreal, I would have to go with the poutine burger. It sounds like a winning combination. You’ll love it! We’re probably making it this weekend! Now that is a burger! My hubby would probably be the only who would be able to eat the whole thing though – I am not sure that I could get my mouth around it :). Oh me too! My hubby destroys it every time! All of these ultimate burgers sound amazing but the poutine one has to be my favorite idea! The poutine burger is my fave too! It’s so yummy! That burger is to die for! I know my mouth just waters every I see her holding it! That burger got the best of me and we made them on the weekend,i don’t this i will get tired of those anytime soon!!! It’s so yummy! Very popular burger around here!